Storming of Jhansi, the Indian Mutiny. Capture of Banda, the Indian Mutiny. Later portrait of Hugh Stewart Cochrane VC. He was also present at the Battles of Kooch, Calpee, Gowlowlee and Gwaliior, and served as Second in Command of Meade's Horse in Central India from 1858 until 1859. Lieutenant Cochrane transferred to the 7th Fusiliers and promoted to the rank of Captain. He was twice Mentioned in Despatches, promoted Bevet-Major on the 19 January 1864, then Major on 28 October 1871 and next Brevet Lieutenant-Colonel on 7 January 1874. 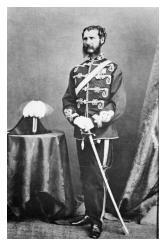 He was Commandant at Khandala from 1874 until 1875, and Commanding Officer at Deolali from 1875 until 1877 before transferring to the 43rd (Monmouthshire) Regiment of Foot, which he commanded from 16 February 1878. On 7 January 1881 he was given the Brevet of a Colonel. Colonel Cochrane retired from the army due to ill-heath, and died at Southsea, England on 18 April 1884, his grave being in Highland Road Cemetery, Portsmouth.